For me, exfoliation is one of the most gratifying parts of my skin care routine! There are so many ways to add this to your skin care routine and I’m pretty sure I’ve tried them all. Being an esthetician, I’ve done lots of experimenting on my skin and have discovered my share of weird but sometimes wonderful gems! Why is it important you ask? Exfoliation will remove a barrier of dead skin cells and inspire new collagen growth as it prompts your cells to turn over faster. Basically, the generating of new cells at the basement of the epidermis sends them up to replace the dead skin cells sitting at the top. As we age, this cellular turnover rate slows down and it can cause premature aging and a dry, dull, complexion. When we encourage new skin cell growth we gain younger cells that will restore your skins clarity and brightness. Who doesn’t want that! 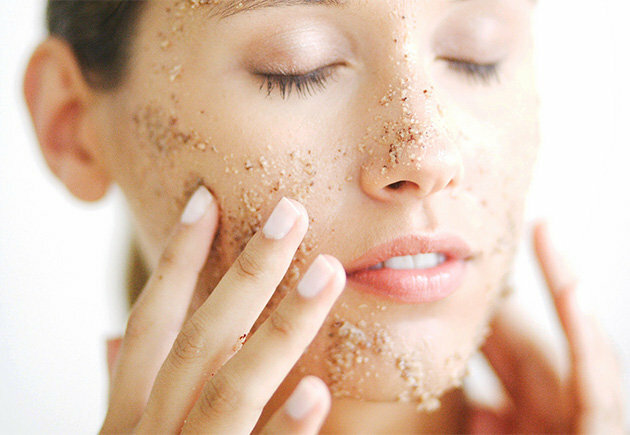 There are lots of different methods of exfoliation in the forms of physically and mechanical. In chemical exfoliation, dead skin cells and the intercellular matrix, or the “glue” that holds them together are dissolved by chemical agents. With mechanical exfoliation we are physically rubbing dead cells off of the skin. I do both (of course). Some treatments are more performance driven than others and depending on your skin type, one form may work better over. Once experiencing different types, generally you’l find your most preferred type. Everyone should exfoliate! It smooths your skin and increases circulation. However, some people can handle more aggressive exfoliation than others so start with caution. A nice way to introduce exfoliation to your at home regime is a rotary brush of some sort. I recommend 2 to 3 nights a week after on a freshly cleansed face. This is an excellent way to help clear out the pores, remove the dirt, sweat, makeup, and excess sebum (oil) of the day. Be gentle, don’t scrub when your using one, since too much force can be harmful, think longer, not harder. Remember the brush oscillates for you back and forth over the skin. As great of method this is, too much of a good thing is bad. Stick to 2 or 3 nights a week. Over exfoliation can compromise the lipid barrier and lead to unnecessary dryness, inflammation, and harm the healthy living cells. There is a certain amount of bacteria that is good and we need to keep for well functioning cells so, we don’t want to strip it. Our skin should be clean of the bad elements but, not clean like a squeaky clean floor. (You get my drift) The biggest thing when introducing something new to your skin is pay attention! If you have signs of abnormal redness, dryness, inflammation, cut back. Sometimes you need to work your way up to more. Think of exfoliation like a form of exercise. As you gradually increase your workout your body becomes accustomed to it. The same goes for exfoliating. After awhile your skin will recognize what you’ve got coming and will invite it in like an old friend 🙂 This is such a great way to refresh your skin and let your natural beauty shine through!